I.W. Tremont offers a wide selection of high quality extraction thimbles available in a variety of dimensions to fit most Soxhlet extraction units. 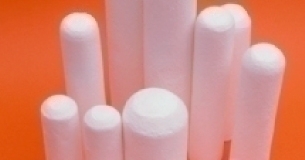 Our extraction thimbles are manufactured in high purity cellulose fibers or high purity glass binderless microfiber. They also feature a consistent wall thickness. Custom manufacturing is available for tubes, sleeves and additional sizes. Extraction thimble measurements as expressed by our company are standard measurements of Inner Diameter (I.D.) x Height. Upon ordering, please mention instances requiring precise outer diameter measurements for use in automated extraction apparatus such as Foss,Velpe, Bchi, Dionex and Gerhardt. A standard product line available in over 30 size variations. OEM projects are easily ramped up in volume from prototype to full production with approval samples submitted at every stage. These formed filter products are produced in small custom batches or high speed automated long runs. Extraction thimble measurements as expressed in the Products Tab are standard measurements of Inner Diameter (I.D.) x Height. Outer diameter measurements can be estimated by adding twice the wall thickness plus Inner Diameter. Upon ordering, please mention instances requiring precise outer diameter measurements for use in automated extraction apparatus such as Foss, Velpe, Bchi, Dionex, and Gerhardt.